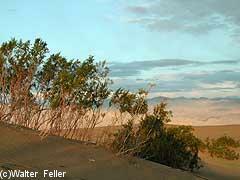 In Death Valley, sand dunes are less common than might be expected. Five widely separated dune fields exist in the national park--yet they account for only a fraction of the total acreage. 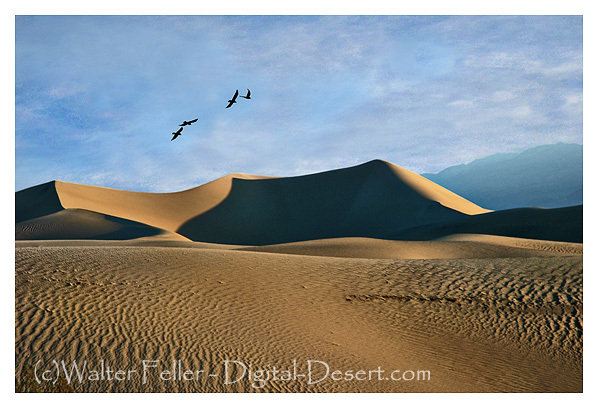 Sand is scattered throughout the desert, but in only a few places is it gathered by the interaction of wind and mountains to form dunes. 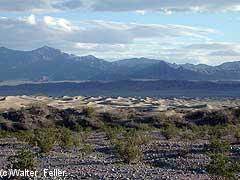 Winds blowing through Death Valley are slowed here at the Mesquite Dunes by the changing shape of the valley and towering Tucki Mountain. The weakened winds cannot carry their cargo of sand any farther. Quartz grains, scoured from the surrounding mountains, compose the deposited sands. 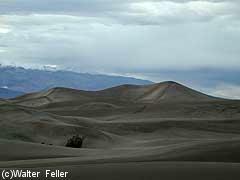 While winds constantly shape and reshape individual sand dunes, the dune field itself does not move. 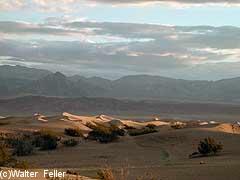 Moderate winds blowing predominantly in one direction form transverse dunes. Winds blowing from several directions create non-migratory star dunes. 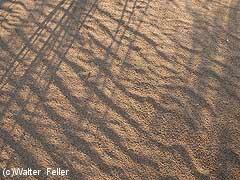 The development of different dune types here indicate a complex wind flow pattern.